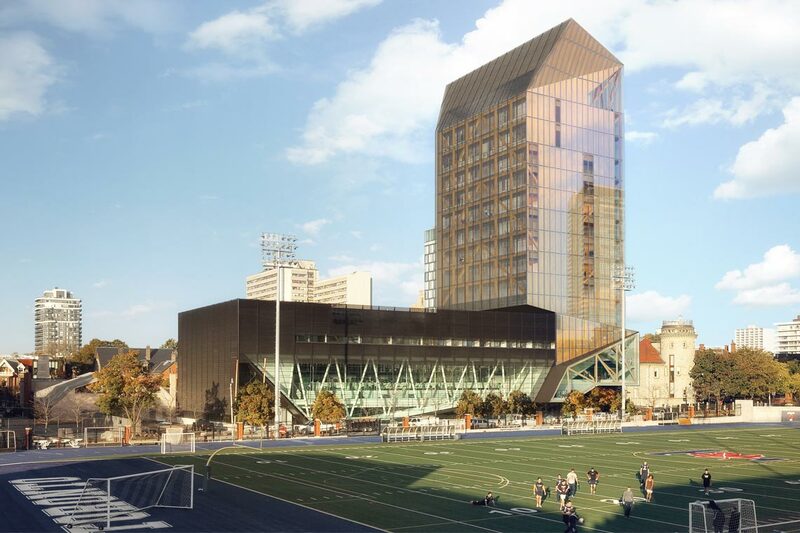 The University of Toronto is set to build a 14-storey academic tower made of timber on its downtown Toronto campus – expected to be the tallest mass timber and concrete hybrid building in North America. It follows a growing international trend towards tall timber structures, which have been lauded for their low carbon footprint, fire safety and faster construction time. “There are a lot of compelling arguments for the use of wood,” says Gilbert Delgado, U of T’s chief of university planning, design and construction. Recognizing the benefits of building with timber, the Ontario and federal governments are providing funding for buildings that use the material. U of T’s wood tower will be financed in part by those government subsidies, and through university funds and philanthropy, says Delgado. The tower will be built above the Goldring Centre for High Performance Sport and will house a number of academic units, including Rotman Executive Programs, the Munk School of Global Affairs, the Faculty of Arts & Science's Master in Mathematical Finance program and the Faculty of Kinesiology & Physical Education. U of T is working on the project with Patkau Architects of Vancouver in partnership with MacLennan Jaunkalns Miller Architects (MJMA) of Toronto and Blackwell Structural Engineers – all of whom worked together on the Goldring Centre, which opened in 2014. The Goldring Centre was designed and built with the structural integrity to be the base for the tower so there will be no need to dig deeper in order to build the taller structure, says Ted Watson, a partner at MJMA. The tower was originally slated to be built using steel, but after becoming aware of government incentives and of research by members of the Faculty of Forestry, including the former dean Mohini Sain, the university decided to go with timber. “The more we looked into it, the more excited we got,” says Delgado. There are many arguments in support of building with timber – the primary one being its environmentally friendly attributes. “In contrast to concrete and steel, which require a lot of carbon for their production and transportation, wood is something that occurs naturally, and it can be transported lightly,” says Delgado. Wood also absorbs carbon, says Watson. “It's actually taking carbon out of the atmosphere. It's reducing greenhouse gases,” he says. U of T’s new tower will be built with cross-laminated timber (CLT) – a method that allows producers to create larger, stronger wood pieces in more consistent dimensions. “They're kind of like plywood on steroids,” says Watson. Using CLT wood, the timber tower will not need to be fireproofed, says Delgado. “If you try to ignite a log with a match, you'll find out how difficult it is to ignite,” he says. The same goes for the wood used to construct the tower. “We're talking about beams and columns that are much larger, much thicker, that are much more difficult to ignite,” says Delgado. Many of the tower’s components will be manufactured offsite so by the time the pieces get to the construction site, they can be assembled easily, quickly and quietly, says Watson. Apart from its technical and environmental advantages, wood buildings are, simply put, aesthetically pleasing. Building with timber also has a wider economic benefit, says Robert Wright, dean of the Faculty of Forestry and an associate professor in the John H. Daniels Faculty of Architecture, Landscape, and Design. “For years we've been seen as a country sending our raw materials out to everybody, and they've been sending manufactured goods back to us, so it's really important that we can build up industries and manufacturing within our own country to use these materials,” he says. As part of the Ontario government’s tall wood building incentive program, the province has also established a Mass Timber Institute (MTI), bringing together organizations from across the province, including U of T and other academic institutions, to study the building practices and benefits of wood construction. MTI’s interim director is Anne Koven, an adjunct professor in the Faculty of Forestry. “The Mass Timber Institute can really animate and excite people and promote building with wood,” she says. The institute has an opportunity to study the construction and future benefits of U of T’s wood tower through all stages of its development, says Wright. “We need to build these buildings as case studies to actually identify and deal with issues and people's perceptions of wood building, in terms of design, construction and the training of people who will actually build them,” he says. U of T’s academic wood tower is still in the design phase of development, awaiting zoning changes to increase the height allowance for tall wood buildings. Construction could begin at the end of 2019.